The 35th Infantry Regiment Association salutes our fallen brother, SGT Lonnie Guy LeBombarb, who died in the service of his country on February 9th, 1968 in Quang Nam Province, Vietnam. The cause of death was listed as Small Arms/AW. 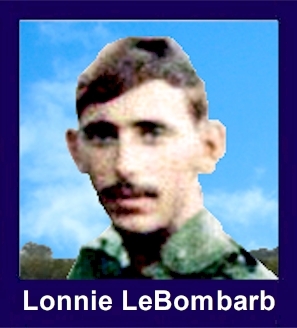 At the time of his death Lonnie was 21 years of age. He was from Lawrence, Kansas. Lonnie is honored on the Vietnam Veterans Memorial at Panel 38E, Line 54. The decorations earned by SGT Lonnie Guy LeBombarb include: the Combat Infantryman Badge, the Bronze Star with V, the Purple Heart, the National Defense Service Medal, the Vietnam Service Medal, the Vietnam Campaign Medal and the Vietnam Cross of Gallantry with Palm Unit Citation. Lonnie Guy LeBombarb was born in Manhattan Ks. On October 30th, 1946. He attended grade school in Alma Ks. The family moved to Lawrence Ks., and he graduated from high school there. He was on the high school Gymnastics team, doing free form exercises. He was an accomplished swimmer and executed some outstanding diving maneuvers. As a young teenager, Lonnie always looked out for the younger children in the neighborhood and made sure they were included in all the games. Before leaving for Vietnam he sold his 1957 Chevrolet. He had planned to buy a new car when he returned. Lonnie is now survived by his mother, Rosemary Parsons LeBombarb Torrez: sister, Carol Hamilton: Uncle, Larry Parsons: niece, Kelly Hamilton Demo: nephews Hudson Hamilton and Lonnie Hamilton and Great niece Riley Jane Lebombarb Demo. Carved in memory with your comrades all. For heroism in connection with military operations against an armed hostile force in the Republic of Vietnam. Sergeant Le Bombarb distinguished himself while serving as a Squad Leader. On 9 February 1968, Company C, 1/35th Infantry was a search and destroy operation west of Hoi An. Sergeant Le Bombarb squad, as it maneuvered against an enemy sniper, came under heavy hostile recoilless rifle, small arms, and automatic weapons fire. Sergeant Le Bombarb and a number of his men were wounded in the initial burst of fire. Although wounded, Sergeant Le Bombarb directed his men to set-up defensive positions, while he continued to fire at the enemy. Shortly after the initial contact, the enemy attempted to overrun the position. Sergeant Le Bombarb, with complete disregard for his safety, went forward of his position to bring in the wounded. As he maneuvered forward, he eliminated several of the advancing enemy, While dragging one of the wounded to safety, Sergeant Le Bombarb was mortally wounded. His personal bravery, professional integrity, and devotion to duty are in keeping with the highest traditions of the military service; and reflect great credit upon himself, his unit, and the United States Army.